South Florida Head Coach Willie Taggart is making his presence known in the highly competitive Florida recruiting circuit. The Bulls added the 9th 2014 commit Saturday in 3-Star East Lake Safety Devin Abraham. South Florida Head Coach Willie Taggart is making his presence known in the highly competitive Florida recruiting circuit. The Bulls added the 9th 2014 commit Saturday in 3-Star East Lake Safety Devin Abraham (Tarpon Springs, FL). Abraham, son of Ex-Buc Donnie Abraham, recorded 67 tackles & eight INTs in 2012 as a Junior after transferring from Gibbs HS. The 5’9, 175 pound Defensive Back is very instinctive & Coach Taggart is high on Abraham’s ability to read plays before they happen & aggressively break on the ball. The drawback on High School Safety is his ‘physicality’, but expect to see Abraham at the CB position for the Bulls. Over the span of two months, Coach Willie Taggart has stockpiled his proverbial ‘bus’ with some of Tampa Bay’s top 2014 local prospects. On 5/30/2013 3-Star Defensive Back Deatrick Nichols (5’10, 175 pds.) out of Telly Lockette’s old stomping grounds Miami-Central. They both were joined on 6/19 by 3-Star Jefferson HS QB/ATH Deiondre Porter (6’1, 167 pds.) who will play DB or Safety for USF (☖ Porter de-committed to head to Florida, but legal trouble made his stint brief). Deatrick Nichols may be one of the best gets for Taggart at a position in dire need of depth. Nichols is one of the most physical & aggressive cover-corners in the state of Florida. Nichols’ exceptional ball-hawking ability is reminiscent of former Bulls Safety & current Philadelphia Eagle Nate Allen. Just how good is Nichols? Larry Blustein at South Florida HS Sports ranked Nichols 19th on his Pre-Summer Top 75 for 2014 & that list is erupting with elite talent. Nichols’ held offers from Auburn, Tennessee, Kentucky, LSU, Georgia, Miami (FL), Clemson, Cincinnati, Rutgers, UCLA & UCF amongst others. Now the best stat of all, 4 current 2014 USF verbal commits were ranked on John C. Cotey’s Debate Time: A Look Ahead at the Class of 2014 list in January. Coach Willie Taggart is slowing assembling his crew of Bullies & he’s focused on Tampa Bay’s premier talent. The future looks bright for Bulls fans that have been dragged through the mud the last few horrific seasons. 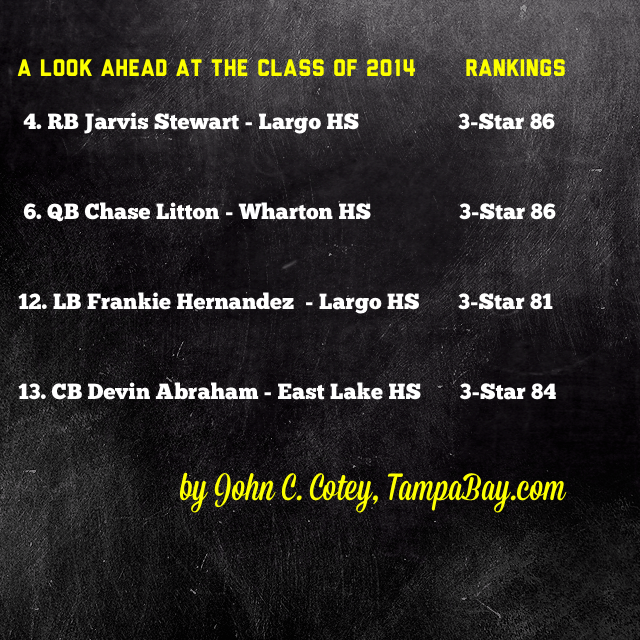 Currently USF’s Class of 2014 is ranked 38th by 247 Sports. The way this is going so far Coach T’s first year at USF could be one of our best years in recruiting ever. The surprising part is that the team is coming off of such a bad couple of seasons that I figured it would take some time to pull in decent recruiting classes again. I just hope the team hits 6 wins grabs a bowl win and can keep all of these kids come signing day. And we’re waiting on Tajee Fullwood’s Announcement right now too. Would make 6 from the Tampa Bay area. I like that Coach T is trying to lock down the hometown and then go into UCF’s hometown and lock it down too!